Famed for its picturesque golden sandy beaches, palm trees and rocky coves, Tangalle is a popular destination for beach goers. Rekawa beach south of Tangalle is an important nesting site for sea turtles; turtle watching excursions are conducted after dark by volunteers from the Turtle Conservation Project. 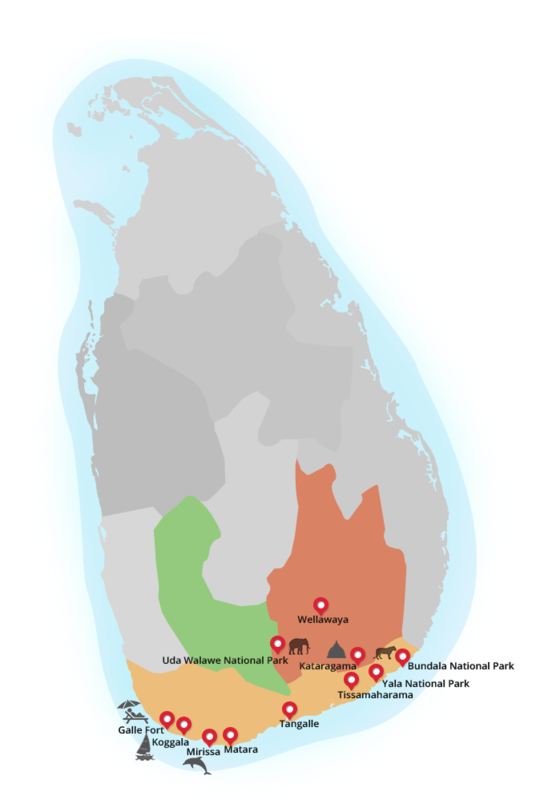 Tangalle is located within close proximity to Udawalawe, Yala and Bundala national parks where day excursions are a popular option for long stay guests to encounter elephants, buffalo, mugger crocodiles and other large animals found in the dry-zone. Going whale watching from Mirissa is another very popular activity between the months of November to April. A visit to the Mulgirigalla in the outskirts of Tangalle, where there is a collection of ancient cave temples on the summit of a 200 meter high rock is highly recommended. The Hoo-maniya Blowhole is a natural wonder formed by cliffs along the south coast. The best time to visit is between the months of May through to August when the south-west monsoon is active as the winds propel water jets which can get to over 15 meters in height.